Let me get into character – doing my best Ray Liotta – to tell you that as far back as I can remember, I always wanted to be a scholar. Though Henry Hill may have achieved his mafioso dreams, I did not have the courage to pursue mine, and so in 2008 I had a lowly B.A. in Classics, a head full of preposterously impractical ideas, and an urgent need to secure gainful employment. You will not be surprised, then, to read that I found myself seated on the opposite side of the headmaster’s desk at a small private school, one of the chief resorts for unemployed Classics majors who would like to remain in some small way connected to the field. My interview with the headmaster went spectacularly well until she asked whether I was the sort of Latinist who read anything simply because it was written in Latin. Without hesitation, I responded that I avoided some large chunks of the surviving corpus, most especially Caesar, whom I would not even read in English. Perhaps it is idle folly to wish for a different past, and perhaps I would have hated that job, which you may be sure was not offered to me. Indeed, my heroic Catonian stand against the Caesarean tyranny of the Latin prose canon could scarcely have earned me any points on the hiring ledger. Yet, for the longest time, I struggled with appreciating Caesar, whose writing literally put me to sleep on countless occasions. A year or two later, a friend who did manage to secure a Latin teaching post told me that he was ‘savoring Caesar’s delicious prose.’ This was enough to make a man spew. But simultaneously, the judgment of generations of critics, culminating in the aesthetic pronouncements of a trusted friend, can at least be granted some consideration, and I began to wonder whether I was missing something. Of course, I did not follow up on this thought, and forgot about Caesar until I myself became a highschool teacher and was forced to teach him just as the students are forced to read him. 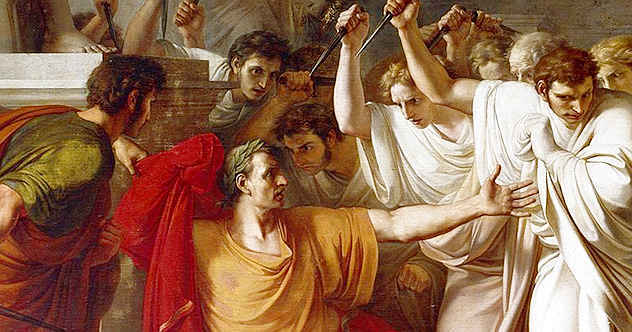 In this way, Caesar seems to resemble Samuel Johnson. Boswell’s Life of Johnson is replete with wit, pointed phrasing, and wonderful critical remarks which are much harder to find in Johnson’s own essays. When contrasted with his famous one liners and other assorted remarks, Johnson’s essays feel turgid and flat. Surely, some of this may be attributed to the shifting standards of prose fashion, but it is hard not to get the sense that the Johnsoniana are far better testaments to his genius than his considered prose. We have some scraps of Caesareana, but it is in some cases difficult to determine just how seriously to take this. A few of the best pieces are from Suetonius, as for example the quip about Sulla not knowing his ABC’s. The high school teacher must take the man who butchered a nation and wrote a lucid prose account of it and make him appeal to teenagers. Naturally enough, they go in for the stories about his adultery and sensational murder, but all of this is external to the text itself. The opposite seems to be the case with Cicero. Students seem to love him until reading biographical details and Ciceroniana; they have much the same reaction as Petrarch, who was so saddened to discover from Cicero’s letters that he was just as petty as the rest of us. Similarly, they find that Caesar is just as boring as their teacher! My students know about my own history of Caesarean reception, if only because I would have them remember that we despise much of what we read when we are young, but this is simply a step in the development of a more refined judgment which, paradoxically, may embrace more as it advances. Never would I have re-crossed the Rubicon if not under compulsion. Few of my students keep up with their Latin immediately after graduation, and I would still hope that if they took Latin back up in middle age they would pick something a bit more lively than the world’s second most famous J.C. Yet, if they return at all, if they remember to keep revisiting those dusty and long-dismissed old codices, they may find that the cobwebs give way to a certain luster, and they may realize that the Elder Pliny was right when he said that no book was so bad that it didn’t have at least one good passage. Homer Lies! And He was Poor! I think this is a great essay and the only thing I would modify is this: you are published (more than once) as a classicist and have written essays online that have been read by thousands. You may not have matched Henry Hill’s meteoric success, but never forget that meteors burn up in the atmosphere or explode on the ground. Thanks – that’s true. Leave it to me to lose the sense of perspective! Yet, I think that I will always still smart just a little bit from the old lack of institutional credentialing. Somehow I forgot about this. I found it again. it is still the best beginning of anything on this site.